A movie with a message. 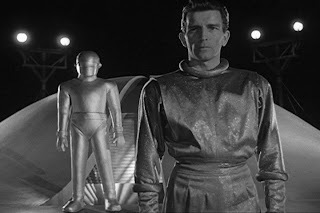 Will we Earthlings be able listen to Klaatu's message and change our violent ways so that we can escape destruction and join the galactic community? Ahhh, a movie that is able to deliver its message without showing us the slaughter of millions of people. Four stars. If you have seen the new version with Keanu, know that it is a VERY different movie, and you must go and see the original NOW. "You've feel different about me when you see my picture in the paper." "I feel different about you right now."